Higher lows and lower highs… Why, that’s a symmetrical triangle forex pattern right there! After recently bouncing off the triangle support, GBP/NZD looks ready to make a test of the formation’s resistance just below the 1.9900 major psychological level. Stochastic is already indicating overbought conditions, which means that pound bears could push the pair back down soon. 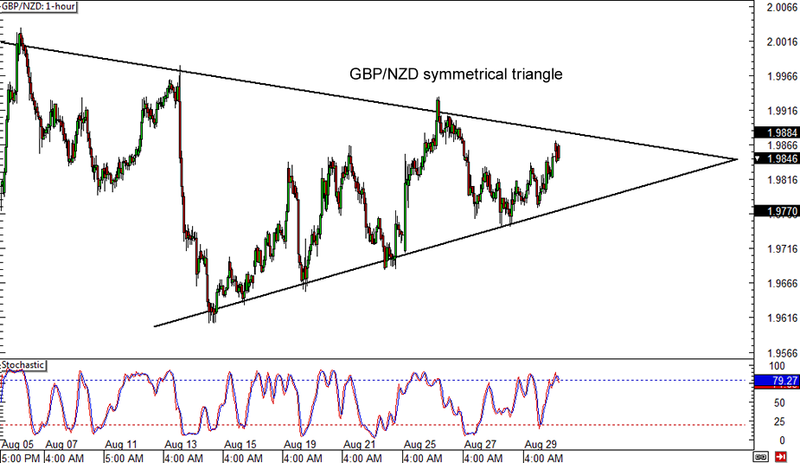 If that happens, GBP/NZD could make its way back down to the triangle support near the 1.9800 handle. If buyers refuse to give in, an upside breakout could still be possible! Now here’s one for the trend traders in the ‘hood! GBP/AUD has been in a downtrend, with the falling trend line connecting the recent highs on the 1-hour forex chart still holdin’ like a boss. The pair has pulled back up to the trend line and 200 SMA resistance, which line up with the 1.7800 major psychological level, and appears to be hitting a ceiling. Stochastic hasn’t quite reached the overbought zone yet but it seems to be pointing down, suggesting that selling momentum might return in a while. In that case, GBP/AUD could make its way back down to its previous lows near the 1.7700 mark. Who’s up for a break-and-retest play? 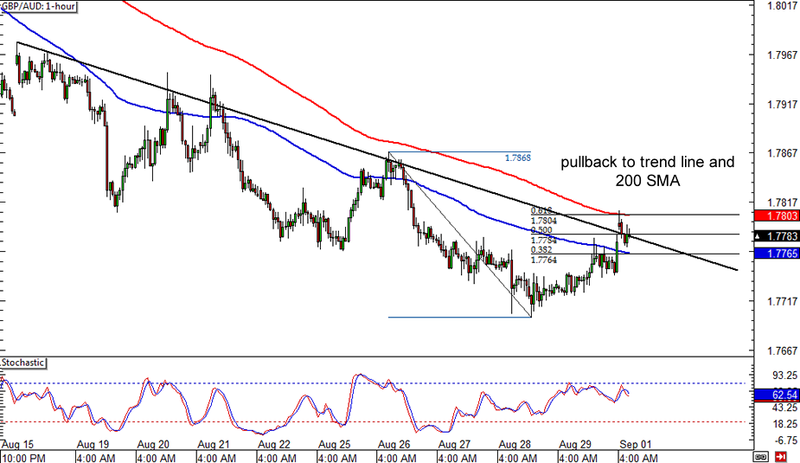 Here’s a neat one on GBP/CHF’s 4-hour forex chart! After breaking below the 1.5250 minor psychological support and area of interest last month, the pair has pulled right back up to that level, which might act as resistance from now on. After all, the 100 SMA is moving below the 200 SMA, indicating that sellers could still be in control. At the same time, stochastic has reached the overbought region and could draw sellers in once it starts heading back down. 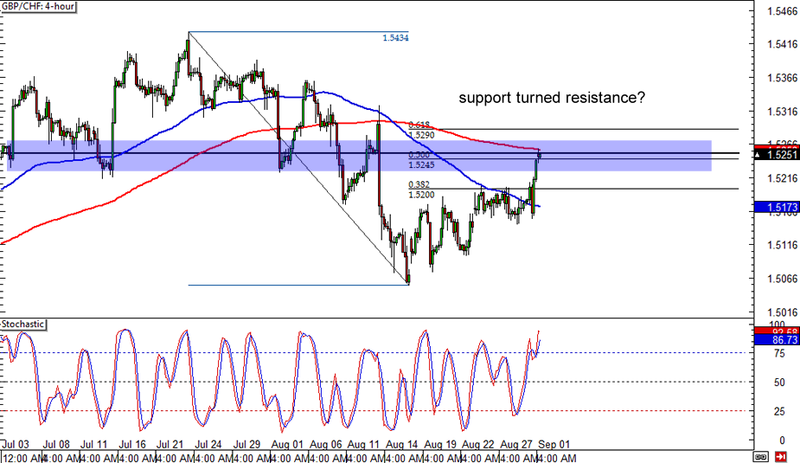 If the 50% Fib holds as resistance, GBP/CHF could sink back to the support area just below the 1.5100 mark.